“They don’t even want to negotiate a long overdue … peace treaty with Israel,” he wrote. Trump infuriated Palestinians and Muslims across the Middle East when he announced late last year that the U.S. would consider Jerusalem the capital of Israel and move its embassy there, upending decades of U.S. policy and igniting protests. Senior Palestinian leader Hanan Ashrawi said in a statement Wednesday that Trump had “singlehandedly destroyed the very foundations of peace” with his Jerusalem declaration. Trump tasked son-in-law Jared Kushner with restarting the effort, and brought his former attorney, Jason Greenblatt, into the White House to lead the negotiations. Trump’s Mideast peace team had held meetings with Israeli, Palestinian and Arab leaders for nearly a year ahead of an expected peace proposal. But by recognizing Israel’s claim to Jerusalem, Trump was seen by the Palestinians as siding with Israel on the most sensitive issue in the conflict. The Palestinians seek east Jerusalem — which Israel captured in 1967 — for their capital. Trump said his decision merely recognized the reality that Jerusalem already serves as Israel’s capital and wasn’t meant to prejudge the final borders of the city. When Trump declared Jerusalem to be Israel’s capital, he insisted, counterintuitively, that the move would improve, not hurt, prospects for clinching a peace deal. In the days after the decision, Trump administration officials said the strategy was based on the notion that Israel had lost faith in the U.S. as a committed partner during the Obama administration. With trust in Washington restored, Benjamin Netanyahu’s government would be more inclined going forward to make tough concessions that would ultimately be needed for a peace deal, the U.S. officials argued at the time, and Israeli officials quietly indicated that they could potentially do so. No one spelled out, however, what the Palestinians would receive in return. Trump on Tuesday also issued a threat to cut off foreign aid dollars to an unspecified list of countries that don’t reciprocate. 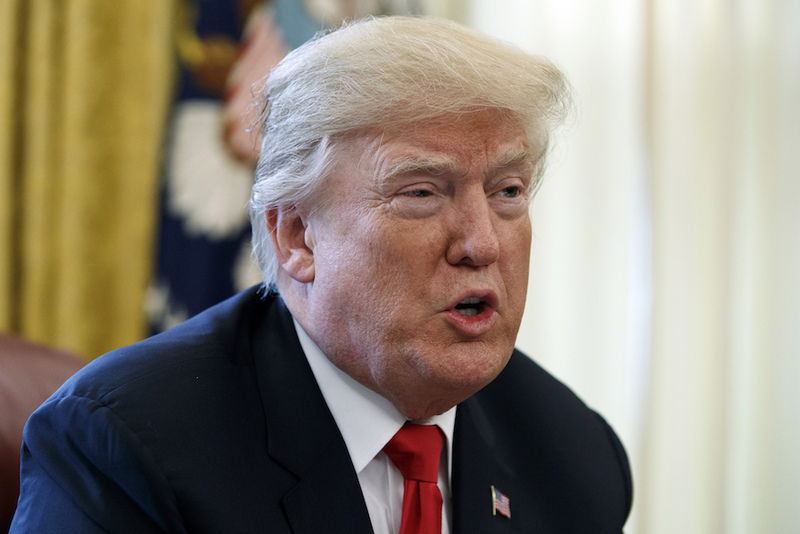 “It’s not only Pakistan that we pay billions of dollars to for nothing, but also many other countries, and others,” Trump wrote, appearing to reference a Jan. 1 tweet lambasting Pakistan for failing to do enough to combat terror groups while taking U.S. aid. “No more!” Trump had tweeted Monday. Trump’s language marks a striking departure from decades of bipartisan American practice and reflects Trump’s transactional view of global affairs. U.S. leaders of both parties have long utilized foreign assistance dollars — a minor percentage of the overall budget — to promote American interests abroad, alleviate humanitarian crises and support oppressed peoples. Since a Dec. 21 U.N. vote condemning Trump’s Jerusalem decision, U.S. officials have been weighing various options for retaliating against the Palestinians for pushing the resolution, which passed by a 128-9 margin. Those options, which were to be discussed by Trump’s top national security aides at a meeting next week, included several involving cutting off some or all aid to the Palestinian Authority. Another option would cut funding to the U.N. agency that provides services to the Palestinians in places like Gaza, Jordan and Lebanon. The talks are in their very early stages, with no determination yet of a fixed amount or percentage of assistance to be cut, according to officials familiar with the discussions. However, the officials noted that only a relatively small amount of the more than $220 million that the U.S. was planning to send to the Palestinians in the current budget year actually goes to the Palestinian Authority. Most of that assistance flows to non-governmental groups that are involved in building civic organizations that promote good governance, anti-corruption efforts, and health and education projects. The officials said one possibility would be to redirect aid from the Palestinian Authority to those groups. Similar proposals were envisioned for the U.N. relief agency for Palestinians, the officials said, noting that Palestinian children in Gaza, Jordan and Lebanon would be disproportionally affected by an immediate and complete cut-off. Chris Gunness, a spokesperson for the U.N. Relief and Works Agency for Palestinian Refugees in the Near East, said it had not been informed of any changes to U.S. funding at this time. One basket of money that is unlikely to be affected is security assistance that helps the Palestinian Authority coordinate police cooperation with Israel, the officials said. They spoke on condition of anonymity because they were not authorized to speak publicly about internal deliberations. Associated Press writers Josh Lederman and Matthew Lee contributed to this report.